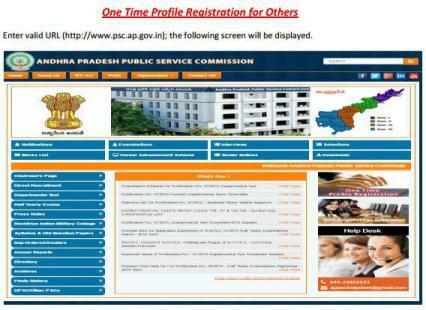 APPSC One Time Registration Steps for OTPR, APPSC New Official web portal psc.ap.gov.in launched Andhra Pradesh Govt. Jobs New Registration and UnEmployees OTPR, APPSC One Time Registration Process, APPSC Job Updates and How to register in APPSC official website. APPSC Departmental Test and AP Govt. Jobs OTPR One Time Profile Registration User Manual Complete Details. Andhra Pradesh State Public Service Commission has invited the unemployed candidates and Employees to register in APPSC One Time Registration. How to register for APPSC Departmental Tests OTPR in New Method. 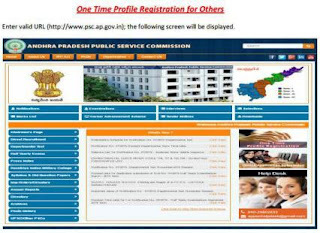 First click One Time Profile Registration link in home page of the portal. Profile Registration link, the following two links will be available. Click on Departmental Test for register in to Andhra Pradesh Public Service Commission portal. Enter valid URL http://www.psc.ap.gov.in Home screen will be displayed. Pradesh Public Service Commission Portal . After clicking on One Time Profile Registration link, the following screen will be displayed. Click on Departmental Test as shown in the below screen. After selecting the Departmental Test option, the following screen will be displayed. Using this screen others can register his/her profile with Andhra Pradesh Public Service Commission.